To meet California’s ambitious emissions reduction goals, the state has opted to pursue a strategy of electrification. But other countries around the world have taken advantage of advanced technology to adopt what may be a simpler and more cost-effective solution to reduce greenhouse gas emissions: hydrogen. 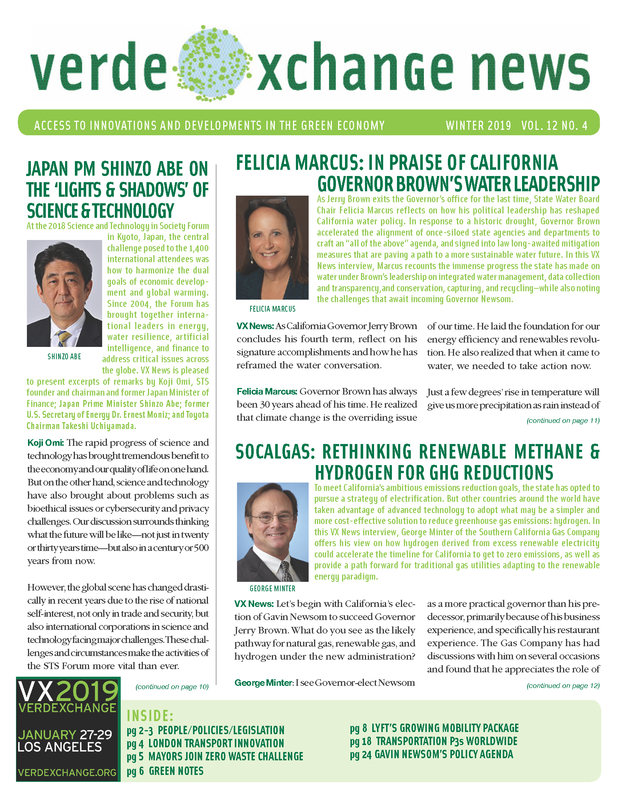 In this VX News interview, George Minter of the Southern California Gas Company offers his view on how hydrogen derived from excess renewable electricity could accelerate the timeline for California to get to zero emissions, as well as provide a path forward for traditional gas utilities adapting to the renewable energy paradigm. Let’s begin by noting that elections surely have policy consequences, and that California recently elected Gavin Newsom to succeed Governor Jerry Brown. What do you see as the likely pathways for natural gas, renewable gas, and hydrogen under the Newsom administration? George Minter: I see Governor-elect Newsom as a more practical governor than his predecessor, primarily because of his business experience, and specifically his restaurant experience. The Gas Company has had discussions with him on several occasions and found that he appreciates the role of gas, particularly for heating and cooking. He also appreciates the utilization of gas in the transportation sector. One of his campaign promises was to displace diesel, and he understands that natural gas is a non-petroleum alternative that is much cleaner than diesel. I believe Governor Newsom will take a practical look at how much time we’ve spent on renewable electricity and see that now, we need to spend some time on renewable gas. I’m looking to him to require gas utilities to buy renewable gas, which will create the financial underpinnings for renewable gas production facilities for dairies, farmers, landfills, and water districts. The biomethane industry is taking off in Europe, and I believe it is going to take off in the US. In 2015, France had something like three biomethane injection facilities. Today, there are 65. In 2013, the United States had about 35; today, there are 85. Renewable gas is a tremendous growth opportunity that California hasn't taken advantage of, and I think Governor Newsom will move us in that direction. The California Air Resources Board’s Scoping Plan contains a Short-Lived Climate Pollutant Reduction Strategy, which requires a 40 percent capture rate of all this biomethane by 2030. So, we already have to capture it. The logical path then—and I think the new Governor would agree—is to put it to use as renewable energy. In past interviews, you have advanced renewable natural gas as a "foundational fuel." Given California’s aggressive climate goals, update readers on why current and incoming state policymakers should appreciate renewable natural gas and captured methane as net-zero-carbon, organic energy resources. Methane is a short-lived climate pollutant, meaning it has an intense effect over a short period. Its global warming effect is almost 85 times higher than that of CO2 accounting for that shorter timeframe. Clearly, to reach California’s climate goals, we have to focus on capturing methane. The problem is that our entire organic waste stream results in methane to atmosphere, because all organic resources naturally biodegrade into methane. However, if we capture that methane, we can use it as energy. That’s renewable gas—and it’s a net-zero-carbon energy source, because it only releases the same CO2 that the organic matter took out of the atmosphere while it was alive and growing. A lot of people think methane is just plain bad because it’s gas, and gas is bad. In fact, many environmental groups in the Los Angeles area have anti-methane campaigns; they talk about keeping methane out of our energy cycle and getting rid of the methane delivery system (otherwise known as the Gas Company.) But the reality is that methane can come from natural and renewable sources, not just fossil sources. So it’s time to rethink methane as a renewable, organic energy resource. Let’s take the fossil out of the fuel! Elaborate on methane as an energy carrier of hydrogen. The gas industry today envisions itself ultimately becoming a hydrogen delivery system. When we talk about methane, what we’re really talking about is hydrogen. Fundamentally, methane (CH4) is a hydrogen energy carrier. It’s four hydrogen atoms held together by a carbon atom. When we combust methane, it’s the hydrogen that gives us the energy outcome. This is a molecular energy conversion. That form of energy production releases emissions, which is why people often don’t want to use it for electricity. But there are some energy outcomes that a molecular conversion can create much more efficiently than electricity. The question is which are the optimal uses for electricity, versus for methane or hydrogen. That question is being asked worldwide, and the EU nations in particular are finding the high-value purposes for each. For electricity, the high value is electronic gadgetry as well as light-duty transportation. The high-value purposes for molecular energy conversation—whether methane or hydrogen—are thermal and industrial processes and heavy-duty transportation. Globally, unlike in California, governments and industry are increasingly moving toward hydrogen as a cost-effective, efficient means of achieving 100 percent renewable energy. What explains how the seeming divergence between California and global nations on the utility of hydrogen? Around the world, the gas industry is moving from fossil gas to renewable gas, to hydrogen production, then hydrogen blending, and ultimately to a pure hydrogen energy delivery system. France, Germany, England, and Australia, are all pursuing this vision. Ironically, California, which we often think of as a leader on energy innovation, is behind on these new technologies. If we want to get to 100 percent zero emissions, we need to use the resources we have at hand. That means taking advantage of the methane that is naturally produced from our organic waste. Agencies are focusing on recycling all their organic waste—wastewater, food waste in landfills, dairy waste, agricultural waste, and more—into renewable gas, then capturing that and moving it into the pipeline for energy use. They’ve realized that their existing pipeline systems can deliver renewable energy at zero emissions. Hydrogen can also address the intermittency of solar and wind through energy storage. At midday, solar energy production is at its peak, but energy usage is low. There’s a mismatch between demand and supply, and we’re wasting the excess capacity we have during the day. The EU nations don’t want to waste that electricity, so they’re building facilities for what’s called “power-to-gas” (electrolytic hydrogen production). If you run electricity through water (H2O), you end up with an H2 stream and an oxygen stream. That hydrogen stream is the energy carrier. It can power transportation through hydrogen fuel cells—which is electric, zero-tailpipe-emission transportation. Or it can be blended into the pipeline system to reduce the fossil gas content. Australia sees their existing gas system as a future hydrogen energy delivery system. Two utilities there are building power-to-gas facilities, and they’re delivering 100 percent hydrogen to 250 homes as a demonstration. In the UK, Leeds University is already blending at 20 percent and looking to go to 40 percent. In France, the Gas Company is engaged in a collaboration with the transmission company GRT Gas and the distribution company GRDF on high-technology hydrogen production and biomethane production pathways. 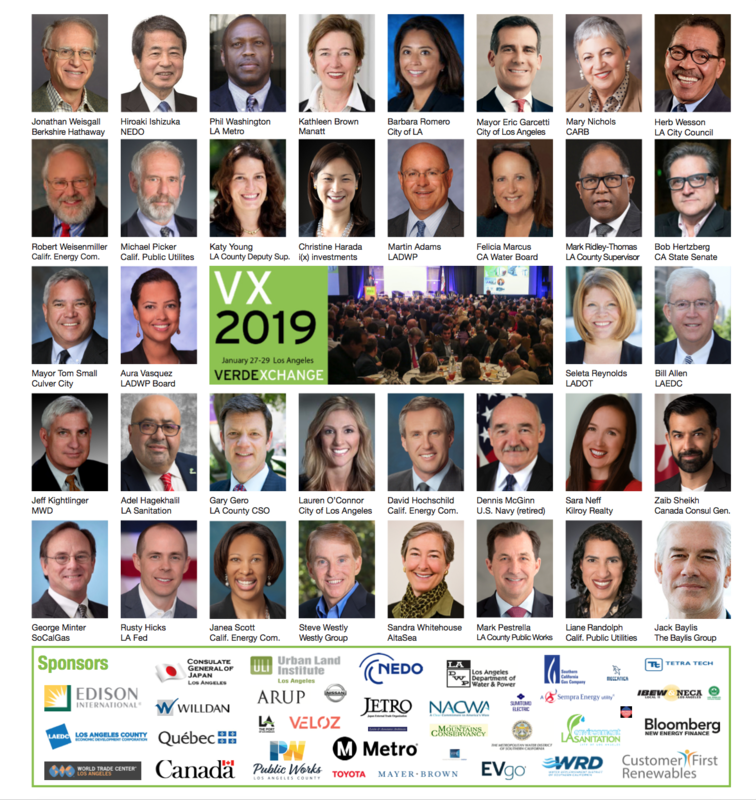 Our senior executives are going to France to visit the Jupiter 1000 power-to-gas facility and their grid injection project, where they’re injecting 20 percent hydrogen into the gas grid. The Gas Company also has our own pilot at UC Irvine, where we have a small power-to-gas facility and a microgrid. The power-to-gas facility takes excess solar generated from their parking lot rooftop solar, and produces hydrogen, then blends it into our gas grid to serve the campus. What, if anything, is SoCalGas learning from utilities and industry in Canada and Japan about how investment in hydrogen fuel technologies can advance climate goals? Canada and Japan are looking at hydrogen as a transportation fuel, and also to eventually displace natural gas and biomethane for energy end-use applications. Canada is definitely moving in this direction. Québec’s gas utility, Energir, is developing their biomethane potential. They’re especially focused on woody biomass—forests and trees—but they’re also very interested in power-to-gas and hydrogen. Their vision is to move from fossil gas to renewable gas—to biomethane, and ultimately to hydrogen. We also work with FORTIS in British Columbia, which is developing biomethane pathways and looking at the hydrogen opportunity. And Ontario’s grid operator has built the first commercial operating power-to-gas facility in North America to manage their energy storage off the grid. They see hydrogen not only as an energy supply opportunity, but also as an energy storage opportunity. Japan is looking at hydrogen for a number of uses. They are very focused on hydrogen fuel-cell transportation. Toyota and Honda have both committed to the hydrogen pathway (as has Hyundai in Korea.) Their view is that hydrogen fuel cells will replace battery-electric vehicles as an electric zero-emission option because they offer both fuel security and range security. Particularly for heavier-duty uses—trucking and equipment—on-board hydrogen fuel can make more sense than the added weight of the required battery. Japan is also looking at hydrogen for stationary end uses—delivering it to homes and offices, and running buildings on fuel cells to provide heat and power. They first piloted this after the 2011 nuclear reactor accident in Fukushima. After the accident, they still had to provide electricity for millions of homes, so they distributed 100,000 hydrogen fuel cells for homes as a test case. Thirdly, Japan is looking at larger-scale fuel cells—50 MW—to address the problem of intermittency with solar and wind. While we often find ourselves with excess solar power during peak hours of the day, at night the sun goes down—and we still need power. Right now, all over the world and particularly in California, the nighttime energy economy is driven by gas. Japan sees the hydrogen fuel cell as an alternative to fossil fuel peaker plants, and to batteries for energy storage. The US National Renewable Energy Lab (NREL), which will participate in VerdeXchange 2019, is currently investigating the link between renewables and gas production. Is the Gas Company participating in this or similar research? We are intimately involved as a contributing partner in some of the most exciting projects NREL is working on. One is a biomethanation project to stabilize hydrogen so that it can be delivered through a pipeline system to end users all over the country—whether it’s a gas station converted to a hydrogen refueling station, or whether it’s your stove or water heater. A scientist in Iceland recently discovered that a microbe called archaea is a very prolific methane producer that eats hydrogen (H2) in the presence of CO2, and excretes CH4, or methane. In other words, you add CO2 to a hydrogen stream and, through a biological process, produce methane. NREL also just announced a big success on another interesting project: artificial photosynthesis. Scientists worldwide have been trying to figure out how plants do what they do, and how we could artificially reproduce the photosynthesis process. The idea is to transform sunlight into hydrocarbons, and then utilize the hydrogen energy that’s part of that transformation. Now, NREL has essentially married a solar cell and a fuel cell to create an electrochemical photovoltaic cell that produces both electricity and hydrogen. In other words, it’s a source of renewable electricity and renewable gas simultaneously. This is pretty exciting. Does California’s environmental policy agenda align with this national research? What is the potential of such research for California and Los Angeles? The potential is quite significant, but the alignment of agendas is a challenge. The conflict between science and ideology—between beliefs and facts—is a problem in our political decision-making bodies, on both the left and the right. For example, the environmental community’s view is that renewable gas is just a shill for fossil gas, and that we shouldn’t use methane at all. But when I ask, “What will we do with all the methane we have?,” nobody has another answer. How do local agencies and sanitation departments charged with managing organic waste align with the research on converting methane to renewable energy? We have methane, and we have to deal with it. Everyone on the waste side of the equation—LA County, LA City, and frankly all the cities and counties throughout the state—is trying to figure out what to do with their organic waste. They are now legally required to divert organic waste away from their other waste streams, and they are starting to realize that they have an energy resource on their hands. There is one operator that is ahead of the game: CR&R. CR&R is an independent waste operator that has franchise agreements with cities in the counties of Orange and Riverside. Several years ago, they increased their tipping fees in order to provide the capital to build an organic digestion facility specifically for diverted organic waste. Now, all their organic waste goes into this digestor, and they’re producing enough renewable methane to fuel their entire fleet—about 400 waste haulers and 100 street sweepers. In fact, they’re producing more than enough. They just signed a deal with the city of Los Angeles for 25 percent of their diverted organic waste. The Gas Company connected a pipeline to them this year, and we’re now getting renewable gas from that facility. Economic analysts say that to meet our legal requirements for diverted waste, California would need to build 50 facilities like CR&R’s. Many people don’t realize that methane mitigation measures are a huge part of California’s plan to achieve our climate goals for 2030 and 2050. Within the California Air Resources Board’s Scoping Plan to get to those goals, the Short-Lived Climate Pollutant Plan represents 30 percent of all our planned emission reductions. Of that, sixty-four percent is methane reduction from generators like primarily dairies, landfills, and wastewater and sewage treatment facilities. Last year, there was a bill in the California Legislature that would have required gas utilities to buy a certain percentage of their gas as renewable gas. The environmental community—including NRDC, the Sierra Club, and environmental justice groups—opposed that bill because they want everything to be electrified. This is an issue of ideology. We’re not going to electrify everything. More importantly, the mission is not to electrify everything. The mission is to reduce greenhouse gas emissions. Electrifying some end uses is one appropriate way to do that—and using renewable gas for heat and heavy-duty transportation is another. Zero emissions is fast becoming a goal of the building sector. What opportunities arise from rethinking methane as a means to that end? A big debate is developing in the building sector. The environmental community wants to electrify the building sector, when in fact, providing renewable gas may be a more cost-effective and easier way of getting to the end result of zero emissions. We did a study with Navigant Consulting that found that, if the Gas Company replaced 16 percent of our throughput with renewable gas, the resulting reduction in greenhouse gas emissions would be equal to or greater than by electrifying 100 percent of buildings by 2030. Nobody would have to buy new appliances or fund capital improvements to their buildings. All we would need is for the Gas Company to buy the waste product from all the organic waste streams—which we already have to do something with anyway. This is such an easy solution, but it’s very hard to get the environmental community to take it seriously.